Does your Prairie Village Sump Pump need service? With the weather we get in Prairie Village, you can never know what to expect. Your sump pump is designed to keep your basement safe from flooding, but there are times when it just can’t keep up. For times like these, Kevin Ginnings Plumbing Service Inc. is here to take care of all your Prairie Village Kansas sump pump needs. Since 1985, we’ve been hard at work learning everything there is to know about Prairie Village Kansas sump pump installation and repair. How old is your sump pump? If it is more than seven years old, it's time to get a new one. Not just any will work, however. 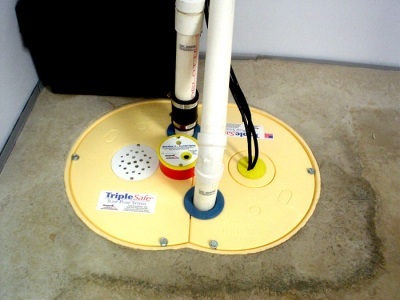 Depending on the size of your home, your Prairie Village sump pump may need to be of a specific size or power. Luckily, Kevin Ginnings Plumbing Service Inc. can work with you to choose the best sump pump for your home's needs. We know how to prepare your sump pump for the worst rain Prairie Village has to offer. There are times when your Prairie Village sump pump just can’t keep up with the barrage of rain. In these situations, Kevin Ginnings Plumbing Service Inc. strives to repair your Prairie Village sump pump as soon as possible so your basement doesn’t become ravaged by mold and decay. We can also help you discuss backup batteries in the event that the power to your Prairie Village sump pump gets cut. If a storm gets so bad that it knocks out the electricity, your sump pump will stop working. This is why you can call Kevin Ginnings Plumbing Service Inc. to talk about backup power options. With so many companies out there working on sump pumps in Prairie Village Kansas, it might seem hard to choose one. The choice is easy...call the Kevin Ginnings Plumbing Service Inc. sump pump experts at (816) 832-4322 to get the fastest, most reliable service in Prairie Village!